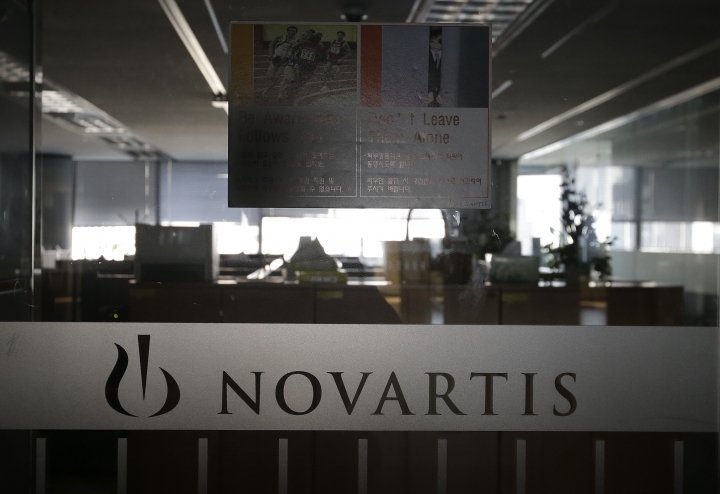 SEOUL, South Korea — Prosecutors indicted the former chief executive of the South Korean unit of Novartis and five other former and current managers over allegations they illegally paid doctors 2.6 billion won ($2.3 million) in return for prescribing the company's drugs. In response, the Swiss pharmaceutical company expressed regret through a statement, but also said without elaborating that such conduct would not have been sanctioned by the "most senior management" at Novartis Korea. "Novartis does not tolerate misconduct and we are already implementing a remediation plan in Korea based on the findings from our own investigation," the Basel-based company said. Paul Barrett, an official from Novartis International, said the company could provide no other details on the case before the trial proceedings. The Seoul Western District Prosecutors' Office said it also indicted 28 others, including 15 doctors and six publishers of medical journals, over their suspected involvement in transactions that took place between 2011 and January this year. None of the suspects has been arrested. South Korean laws ban drug companies from providing doctors rebates or discounts for the drugs they prescribe. According to the prosecution, Novartis' South Korean associates, including former Novartis Korea chief executive Moon Hak-sun, tried to go around the laws by funding academic events organized by publishers of medical journals, where the invited doctors allegedly received kickbacks disguised as attendance fees. Moon served as the chief executive of Novartis Korea before he agreed to take a temporary leave of absence in April, Barrett said.